BNS/BNF is designed for liquid contains foreign (solid) object, and it can pumping up solids that the 1/3 size of suction bore(50∼250mm). Both Stainless Steel and Cast lron can be used for the parts contact with liquid. Small sized rigid type BNS/BNF has excellent reliability and durability under severe condition. Ball-Circulation Systems for condenser tube cleaning at Power plant. Transportation of sludge from a sewer systems. Transportation of crumb (rubber) slurry. Sludge transfer and drain at General Industries. Chemical, Paper Pulp, Food, Medicines, Textile Industries, and Other Industries. 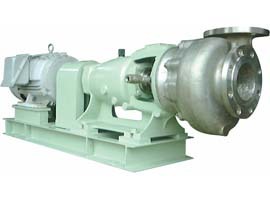 For cast-iron material the pump model is BNF. 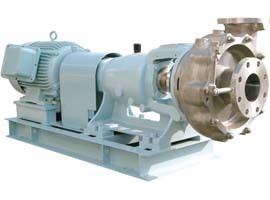 Quenching is adopted for pumping liquid of temperature less than -10ºC.